Sorry folks, I’ve been busy with other stuff lately, but finally, I’ve put fingers to keyboard and come up with the following to entertain and delight you. 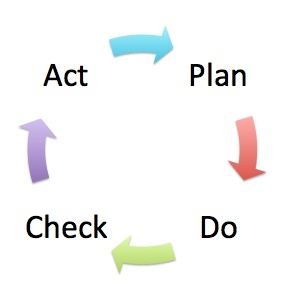 Anyone who has worked in manufacturing for any length of time, or who has been exposed to the concepts of Lean Manufacturing has heard of the Deming cycle, or the PDCA cycle. Plan-Do-Check-Act. For those who’ve never heard of it, PDCA is supposed to be a concise description of the cycle used to continuously improve a process. It’s usually visualized as one of those circle-arrow graphics we see in every other PowerPoint presentation. I get the idea, but honestly it’s never really resonated with me. Probably because Do, and Act are synonyms (trust me, I looked it up), so we’re basically told to Plan, Act, Check, Act and then repeat the process. You see the problem right? Once I’ve acted for the 2nd time isn’t it too late to plan? And if I’ve been so impetuous, shouldn’t I at least check again before I plan the next change? Not if I follow the graphic which is ALWAYS posted somewhere to remind me . This might be a little semantic, but in terms of describing the process of continuous improvement, it isn’t correct. The key to understanding continuous improvement is that (as the name implies) it never ends. 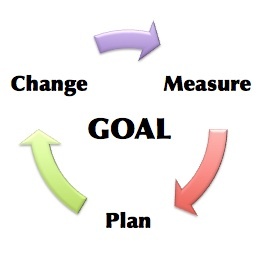 You evaluate a process you want to improve, you plan a change, make the change, measure the effect of the change, plan another and measure the effect of that change and so on. As time goes on, the series of improvements, which are usually relatively small, add up to significant gains in the long run. In “Lean” terms, I think I’ve eliminated some “Waste of Overprocessing”.